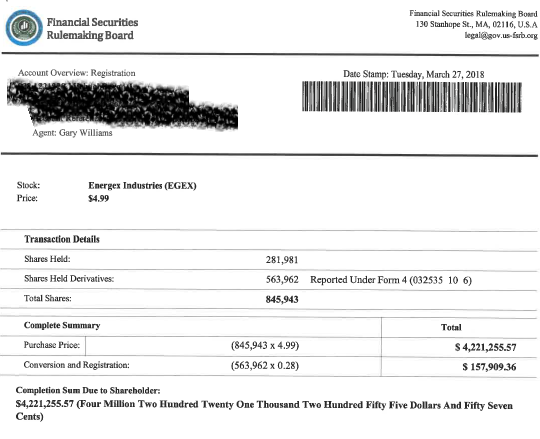 An investor from the United Kingdom notified FINRA that he received a detailed document that appeared to be signed by Susan Schroeder, FINRA's Head of Enforcement. The letter offered "guarantees" related to the conversion and registration of shares of stock that would be transferred to the investor, contingent upon the investor's advance payment of $28,000. 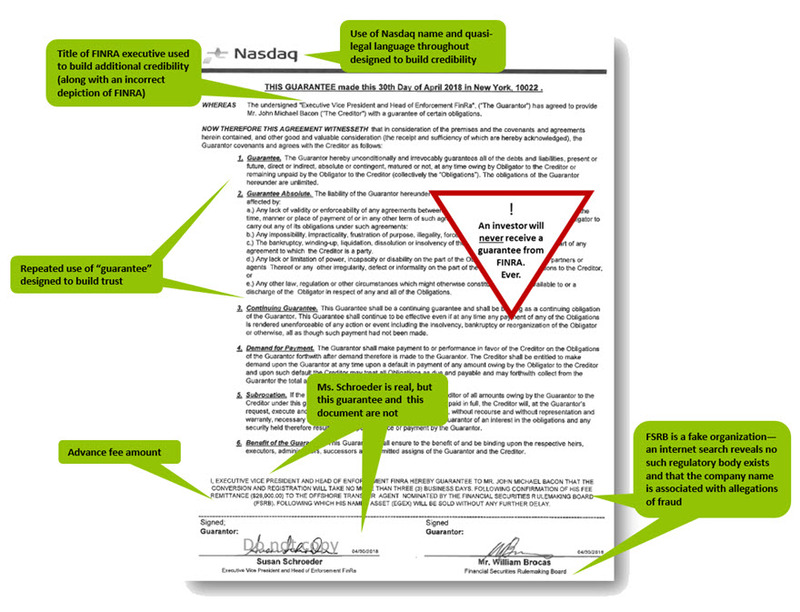 FINRA staff quickly identified the document as fraudulent. Documents attached to the letter included more than 60 pages of detailed information including fake Nasdaq trade reports, false FDIC "Data Capture Forms," and other quasi-official documentation designed to build credibility. All documents were part of a well-engineered advance-fee scam. As we stated in an earlier Alert, FINRA, its officers and employees do not offer investment guarantees. Below is an example of a recent advance-fee ploy. We highlighted various tricks of the fraudster's trade. Once fraudsters have targeted an investor for one of these advance-fee scams, they are relentless in their communications. Phone calls start out as friendly and business like, albeit usually very persistent. Rapport is established and trust is gained methodically (a good fraudster is a master at winning trust). In the "courtship" stage, the fraudster is always available to talk, which seems refreshing to the investor in today's era of robo-assistants. Communication also includes detailed emails that often come with official-looking attachments and "verifications" like the one below. In this example, the fraudster is using the above document to further convince the investor to send an advance fee to gain access to more than $4 million dollars, purportedly held in escrow at a U.S. bank. FINRA's experience is that most of these swindles take aim at international investors, particularly those residing in the United Kingdom and Australia. No matter where you reside, no one is safe from advance-fee scams, so always be on the lookout for the red flags of fraud. The best way to avoid losing money in advance-fee, phishing or other types of scams is simply to hang up or not respond. This is easier said than done, since correspondence can be well crafted, and the perpetrators are con artists highly skilled at delivering their fraudulent pitches. If you are suspicious about an offer, or think the claims you are receiving might be exaggerated or misleading, contact FINRA or another regulator BEFORE you send any money.